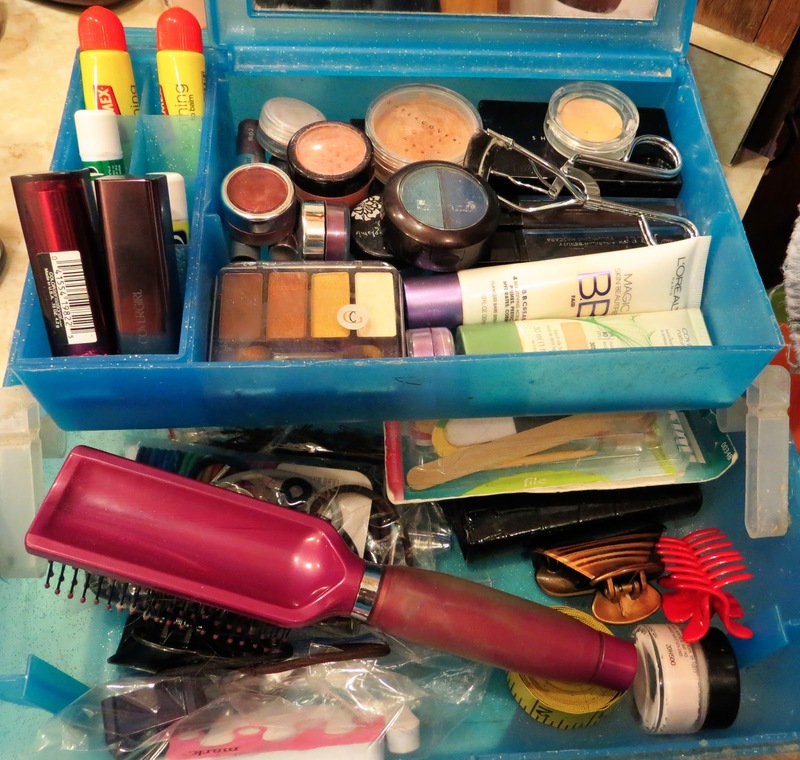 Four Ideas to Organize Makeup That You’ve Never Thought of Before! Lately I’ve been blogging a WHOLE lot about makeup. Which makes me very happy because I *love* the stuff! 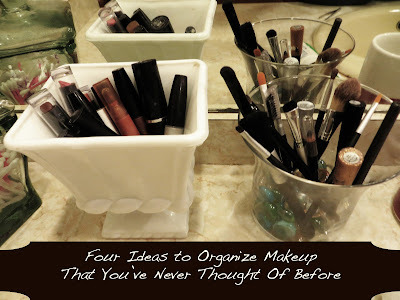 Because I have been I thought that it would make perfect sense if for this week’s Organizing In Small Spaces to focus on how to organize makeup! At my Bible Study the other week I was talking about Organizing and one of the gals said that she wanted to be organized but she hated how anytime she read anything about it they wanted you to go to some expensive, specialty organizing store to buy all sorts of things. I hate that too and that’s definitely not how I organize–it’s much better to take things that you already have, can get inexpensively, and to use things for new purposes that can serve many different needs as yours change and evolve! So here are Four Ideas to Organize Makeup that You’ve Never Thought of Before! 1. 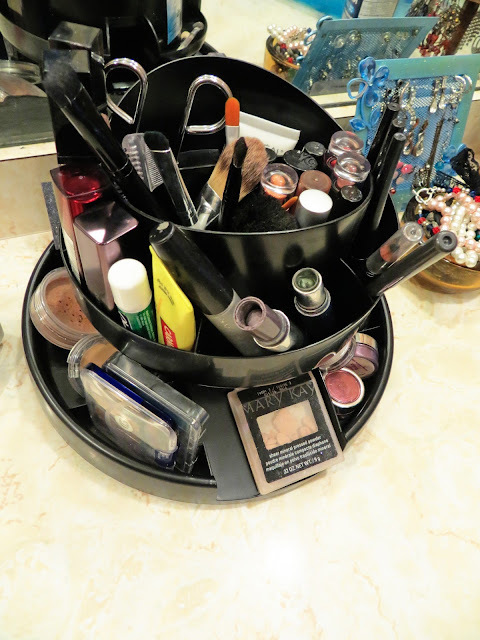 Use Glass Jars, Vases, and Containers to hold brushes, eyeshadow, lipstick & gloss. You can see in the picture above that I have all of these out on display in our bathroom. I found that especially with these items for me out of sight meant out of mind and I just never used/wore them. So when I saw a few variations of this idea on Pinterest I knew it would be perfect for me! At first I used a Pickle Jar that I just removed the label of and washed! If you wanted to recycle your jars in this way here is a great idea for how to take their cute factor up a notch by coloring them! When I found the two pieces above for .50 cents a piece at a garage sale I “upgraded” to them! 2. Use a “Tackle Box” – you can find “tackle boxes” in the beauty section of Walmart or pretty much any large store like mine shown above. They’ve always been my go-to storage for all things beauty related and they’re super handy and travel well. 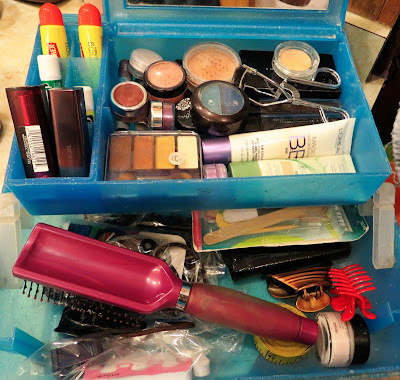 However if you have a very large makeup collection that you want to keep in one spot you might consider just purchasing an actual tackle box like this gal did! 3. Use a Rotary Organizer! So I know that shopping the Office Supplies section wouldn’t be your first thought for organizing makeup, right? But it really can be one of the best places to do it! 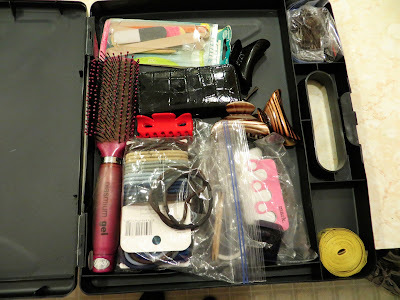 I had originally wanted the OIC26255 Recycled Organizer for Bob and his school supplies but when it arrived I thought that it would be too perfect to organize all my makeup! I love that unlike the tackle box everything is in its own little section so I can see it all at a glance (or a spin) without having to dig! I’m thinking to take the pretty factor up a notch I’m going to spray paint it silver which will really add a custom & glam feel to it! This is easy to keep out on your counter or it slides nicely underneath as well. 4. Use a Case! Just like the organizer above I got this OIC83382 Portable Dry Erase Case for hubby then stole it, haha! It’s the perfect place to store what I had in the bottom of the “tackle box” before and when stored like this it no longer is stacked upon itself so it makes things easier to find. The thin, long design is space saving as you can keep it underneath the rotatory organizer or stand it on it’s side and slide it along the side of the cabinet. 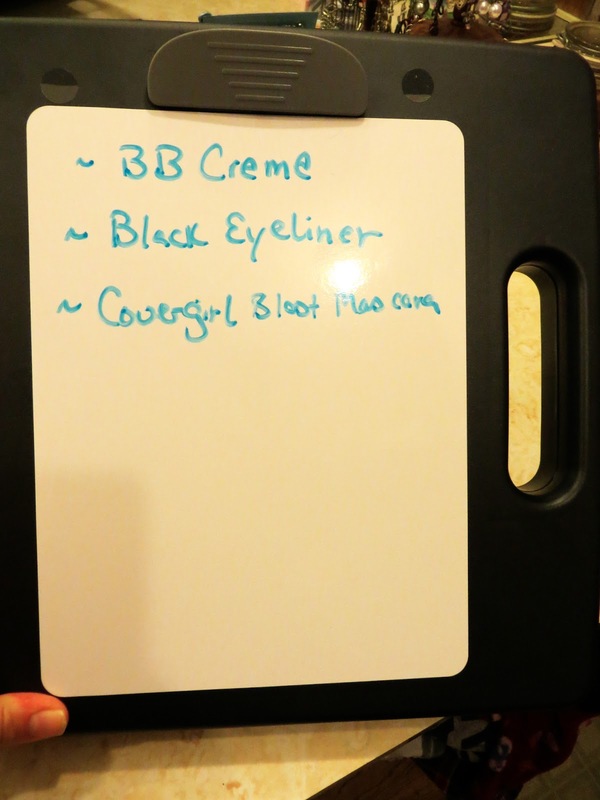 Plus I love the dry erase board on the outside–it’s the perfect place to keep track of items I want, love, or am running low on! Again you could easily glam up the look using metalic spray paint–but since this won’t be displayed I probably won’t bother. How do you organize your makeup? Do you have any awesome, crazy-cool ways that I don’t know about? Leave me a comment and let me know! I was sent the rotary & case from Shoplet for my review–all opinions, pictures, crazy cool ideas, and other products are my own! Can I simply just say what a relief to uncover someone who genuinely understands what they are talking abouton the net. You certainly realize how to bring a problem to light and make it important.More people have to check this out and understand this side of the story.It’s surprising you aren’t more popular because you most certainlyhave the gift. Next Next post: Friday Food ~ Chocolate!! !